Kitchen counters can set the tone for your kitchen and nothing sets the tone like granite countertops. Granite is one of the most popular building materials, because it’s beautiful, durable and almost maintenance free. No two slabs of granite are identical. This allows you to create a entirely unique look that can’t be duplicated, but with a broad range of colors and patterns that also make them easy to match any kitchen decor. The ideal characteristics of granite also makes it the perfect stone for your bathroom counters. Granite doesn’t scratch, is heat resistant and holds up well to normal wear, and it’s affordable. Divine Design Stone & Cabinetry offers an array of colors, patterns, surface designs and ornate edges to create the elegant kitchen and bathroom countertops you’ve always wanted. Stone countertops have become more accessible than ever and granite offers an affordable stone that can hold up to the everyday demands in your kitchen. The innate characteristics of granite make it an extraordinary surface for kitchen countertops. No more worrying about hot pans burning your counters. Cut up vegetables on these counters and you’ll ruin the knife before you scratch the surface. They’re also easy to clean and keep glossy for years to come, but it’s their beauty that makes them a favorite in decorative kitchens. Divine Design offers top quality granite countertops at surprisingly low prices. Trust our professional, experienced kitchen designers to create the perfect granite counters for your kitchen. When you want distinctive bathroom countertops that are as beautiful as they are durable, turn to granite. We can help you create an ultra-modern, yet functional solution for your bathroom counters made of naturally elegant granite. Granite counters are ideal for sink areas and give your bathroom a sophisticated look at a price you can afford. We can design and install custom granite counters in your bathroom(s) to create a chic space that’s timeless. We offer a wide array of colors, textures, finishes and thicknesses to create an aesthetically pleasing, harmonious appearance throughout the room and match any decor. We offer first-rate products that guarantee the best properties and functionality at highly competitive prices. 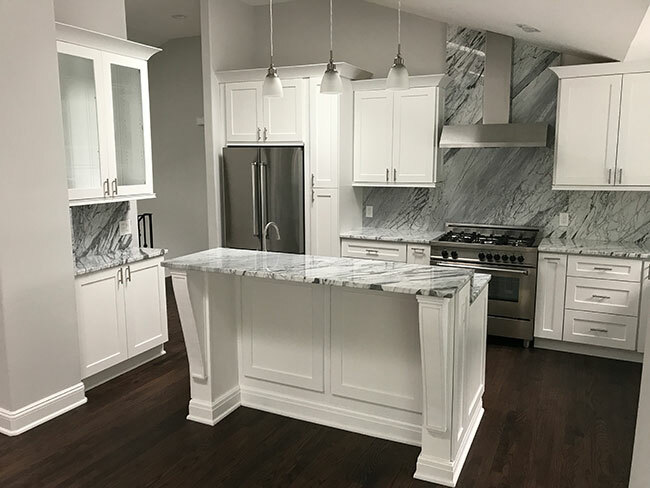 Contact Divine Design Stone & Cabinetry for a free no-obligation estimate on your custom kitchen and/or bathroom countertops or visit our showroom in Hackensack, New Jersey to find the perfect piece of granite for your counters today!